We have two great ways to book your reservation now. 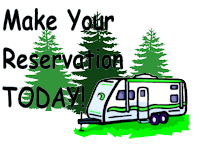 2019 Holiday Rates for Memorial Weekend (May 23, 24, 25, 26) Freedom Weekend (July 3, 4, 5, 6) Labor Day Weekend (August 29, 30, 21, Sep. 1) $5 more per night, THREE night minimum, not eligible for discount. A deposit of $50 is required at the time of booking regardless if you call your reservation in or book it online. The remaining balance is due at the time of check-in/arrival. Cancellation All reservations will be subject to a $10 cancellation fee. No refunds for cancellations made within 7 days (14 days if holiday weekend) of scheduled check-in date. Call the office for more information about available discounts for being a member of one of the listed clubs. Please have your membership card with you at arrival/check-in to avoid any confusion. Wesleyan Woods is a non alcoholic campground.